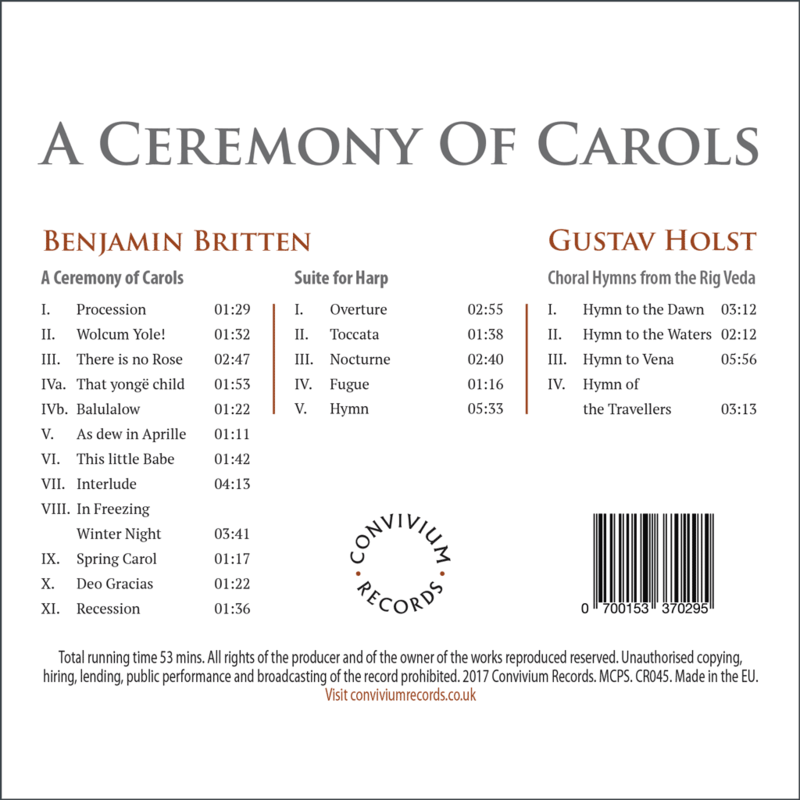 Benjamin Britten’s A Ceremony of Carols Op.28 was composed in 1942 on board a Swedish cargo vessel – the Axel Johnson, as Britten and Pears returned to England after three very successful years in the United States. The journey took almost a month and must have been very tedious since conditions on board were hardly luxurious. 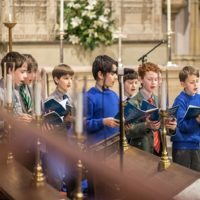 A Ceremony of Carols is scored for three part upper voices and harp and uses a plainsong setting of Hodie Christus natus est to open and close the work. The Procession and Recession are intended to be used as the singers enter and depart. 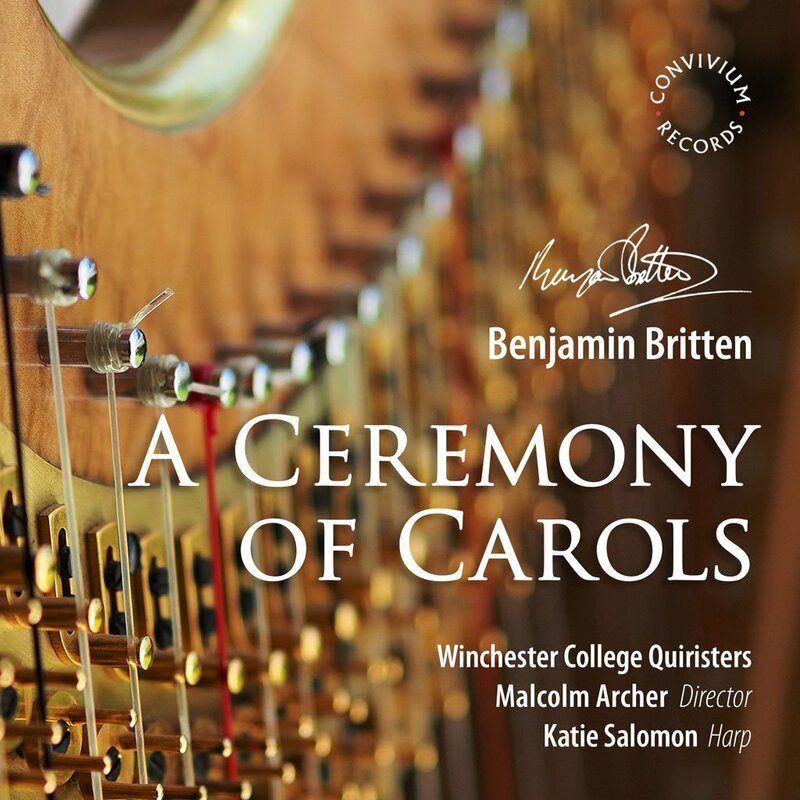 The work is beautifully written for both the voices and the harp, and Britten chooses poems which tell a story about the birth of Christ. After the opening plainsong, we hear Wolcum Yole! an energetic movement with striking chords from the harp. This is followed by a more reflective There is no Rose and then a solo boy sings a plaintive setting of That yongë child with a sparse but effective accompaniment. Then comes Balulalow with a rocking harp accompaniment and a treble soloist at the start. As dew in Aprille (I Sing of a Maiden) has a rousing opening, and then effective overlapping counterpoint between the voices over an animated harp part. This little Babe is a setting of great energy where Christ comes to ‘rifle Satan’s fold’ and ‘all hell doth at his presence quake’. The harp Interlude that follows is cleverly based upon the opening plainsong and imaginatively developed into a very atmospheric movement. In Freezing Winter Night follows with harp trills and a shivering feel to the music, and haunting treble solos at the end. 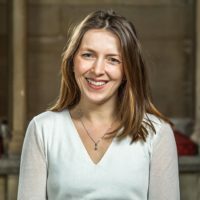 Spring Carol is a delightful call and response duet between two boy soloists, with the second treble responding with ‘the deer in the dale, the sheep in the vale, the corn springing.’ The final carol is Deo Graciasusing the words ‘Adam lay ibounden’, and is an exciting setting culminating in rousing harp glissandi’. The boys then leave to the Recession, a repeat of the opening plainsong. Britten’s Suite for Harp is one of the landmarks in the harp literature. 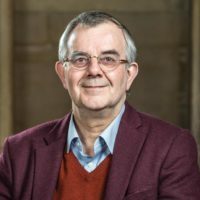 It was composed in 1969 for the leading British harpist Osian Ellis, and performed in the Aldeburgh Festival in the same year. It uses a variety of harp techniques and is written in five contrasting movements, including a majestic opening Overture, a very fast Toccata, a calm and illusive Nocturne, a Fugue and a Hymn which is a wonderful set of variations on the hymn tune St. Denio (Immortal, invisible). Britten’s ingenious use of colour is present throughout the work, which was an immediate success at its first performance. In the years from 1900 to 1912, Holst developed a keen interest in the early religious literature and poetry of India, and even learned the basics of the Sanskrit language at University College, London. He then made his own translations of a number of Sanskrit poems and decided to set them to music. The Rig Veda is a set of more than 1000 ancient Indian hymns of praise dating from about 1000 BC. Holst set to music four groups of these hymns entitled Choral Hymns from the Rig Veda. The Third group is scored for upper voices and harp (or piano) and was composed in 1910 for Frank Duckworth and his Ladies’ Choir in Blackburn, Lancashire, and first performed on 16 March 1911. The four movements are Hymn to the Dawn, with a backing of rippling arpeggios, Hymn to the Waters, with its animated rhythm and unusual 21/8 time signature. Then cones the gentle and atmospheric Hymn to Vena which describes the sun appearing through the mist, and the elaborate Hymn of the Travellers, with a distinctly Eastern sonority and evoking a God who is the guide of travellers along the roads of this world and that leading to the next.